Happy July! I'm so excited to share a review for a cookbook* today that is a serious game-changer. At least, it was a game-changer for me! This book is really fantastic. Dreena Burton is well known for creating delicious, healthy plant-based foods, and this book is an example of just how talented she is. I've followed her forever (I can still remember looking at and being so excited by Vive Le Vegan! when it first came out!) 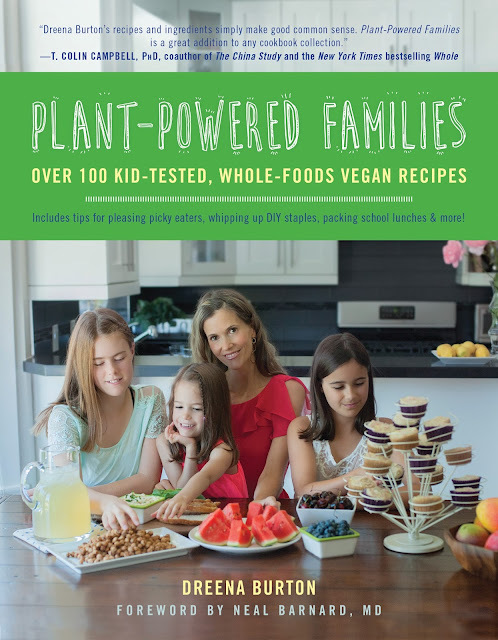 and, when I got the opportunity to receive a copy of Plant-Powered Families, I jumped on it. In my opinion, it's her best book yet. What makes this cookbook so great is not only the wonderful recipes, but also all the features included in the cookbook. It has a great introduction that helps you get started with a vegan kitchen and pantry, plus appendices in the back that include tips for parenting picky eaters, ideas for what to use in school box lunches, and nutritional information for foods and ingredients used throughout the book. I'm thankful that many recipes are already gluten-free or can easily be made gluten-free, and many have recipe notes for how to make them gluten-free, as well as nut-free. Most recipes are already soy-free and use whole, unprocessed foods (like hemp! there is so much hemp - one of my favorite foods!). Also, beautiful [and colorful] pictures accompany nearly every single recipe! For this review, I tried the Cinnamon French Toast (found on p. 36). This recipe caught my eye because it didn't call for any soy products or other strange filler ingredients that many vegan French toast recipes list. I changed two things from the original recipe: I used black chia seeds (I had them on hand, and didn't feel like going to the store to get white ones) and I used hemp seeds instead of cashews (which is included as an option in the recipe notes). The result? A wonderful and delicious breakfast dish. The toast had a great texture and I truly felt like I was eating "regular" French toast. I loved that I was eating a whole-foods-based breakfast that was soy-free and high in nutrients such as protein and omega-3 fatty acids. D and I both approved, and finished the dish rather quickly. I'm really pleased to be able to share the recipe with you here, and besides the minor notes above, this recipe is perfect as is, and I recommend you make some immediately! Breakfast for dinner, anyone? Even more, I'm excited to offer one lucky reader a free copy of this wonderful cookbook! Find the entry for the giveaway below the following recipe. The giveaway is now closed. Thank you for entering! I remember French toast fondly from childhood - and so does hubby. It was the "treat" breakfast we had as kids, probably far easier for our parents to make than pancakes, and a great way to use up odds and ends of breads. This version is much healthier than what I ate as a kid, and I tell you our girls love it just the same. In a blender or using a handheld blender, puree the milk (starting with 1 cup; see note), chia, cashews, cinnamon, vanilla extract, and sea salt until very smooth and thick (it will get thicker as it sits a little while and the chia swells). Prepare a nonstick skillet by wiping over with a touch of oil (you need a nonstick skillet, or this will be a sticky event!). Turn heat to high for a few minutes to heat up the pan, then reduce to medium/medium-high. Dip a slice of bread into the batter. Turn over and let it sit in the chia mixture for a few moments to soak, then remove and place in the skillet. Repeat with the other slices, frying 2-3 pieces or more at a time, depending on the size of your skillet. Fry for 3-5 minutes on each side, until light brown. Keep the heat high enough to get a good sear/crust on the bread, but reduce if it's scorching. Note that the slices will be sticky until they are ready to be flipped, so be patient. Repeat until all bread is used. 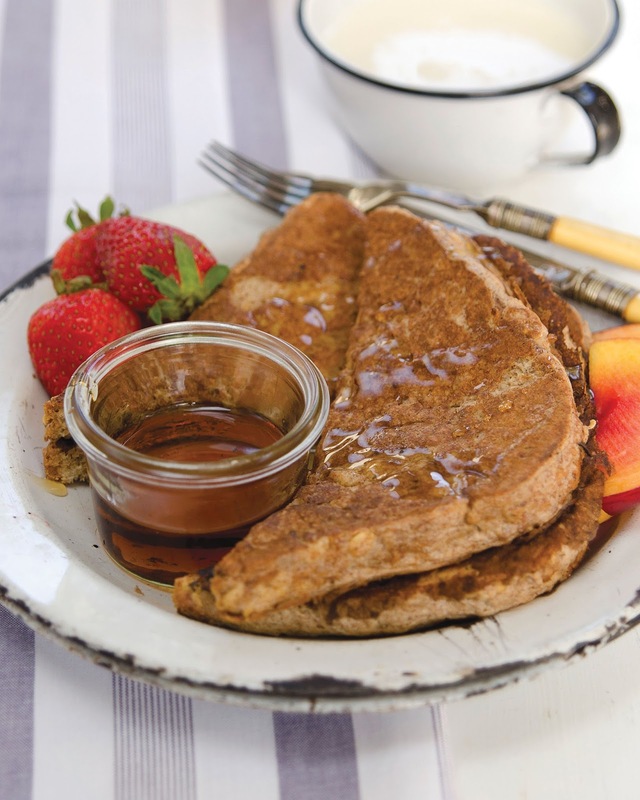 Serve with fresh fruit and pure maple syrup. Another fun serving idea is to make sandwiches out of the French toast, slathering some nut butter between two slices, then serving with maple syrup. Nut-Free Option: Replace 1/3 cup of cashews with 3 tablespoons of hemp seeds. Bread Note: You may use 6-10 slices of bread, depending on the size of the slices. Milk Note: After the batter sits for a few minutes it can become quite thick. You can stir through another 1-2 tablespoons of milk if it has gotten too thick with standing (if you have less than half the batter left, use just 1 tablespoon). *I received a complimentary copy of the cookbook to review; however, all opinions are mine.